In particular, we would like to bring to your attention an important editorial from Scott Sandie regarding the future of Broken Arrow Magazine. We have been in touch with Scott and would like to hear from readers on their thoughts on future publication. Drop a comment below. The time has come to make changes in the way that Broken Arrow is published. For the past three years we have been struggling with increasing costs generally and the spiralling cost of postage in particular. These increases have (apparently) been required as part of moves to privatize The Post Office here in the UK. The reality is that a magazine that three years ago cost less than £3 to post airmail to the USA now costs £4.20 (nearly $7). That’s an increase of 40%. We have raised subscriptions to cover some of these recent postage increases but you might remember we decided to absorb last years. Presently a US subscription is $41 and needs to go to $45 this year and higher in future. The cost for Europe in terms of increases is no better. In the past many of you have said that you will pay whatever rate is required and many members also make annual donations to the NYAS – some quite substantial. Both gestures are much appreciated, but Jo and I are increasingly uncomfortable with a subscription that could go to $50 or more – it just gets silly. We have costed out postage alternatives (especially bulk carrier to the US and Europe and then local distribution) but the saving isn’t that significant and this route adds a layer of complexity to the operation. We have also considered printing fewer pages to get the weight of the magazine below 100grams for printed paper – the lowest category possible – and therefore a reduced postage rate. But to achieve that an issue would only be roughly half the size it currently is, and we have rejected that too. Jo and I will carry on doing exactly what we do just now, but Broken Arrow will be made available quarterly as a downloadable file. Subscriptions will be significantly reduced to £5 (or equivalent) per annum The magazine will look almost exactly as it does just now. Those members who are happy reading it on screen can do so. Those who would prefer to read a hard copy can print it off. If you want a neat copy for your collection you can go to your local print shop and have it properly printed and bound, using your saved subscription cash! It might be possible for some kind of ‘print-on-demand’ service to be established in each country or continent, with an agent (possibly an NYAS member) co-ordinating the printing for those keen on that. This possibility will be investigated in the coming months. 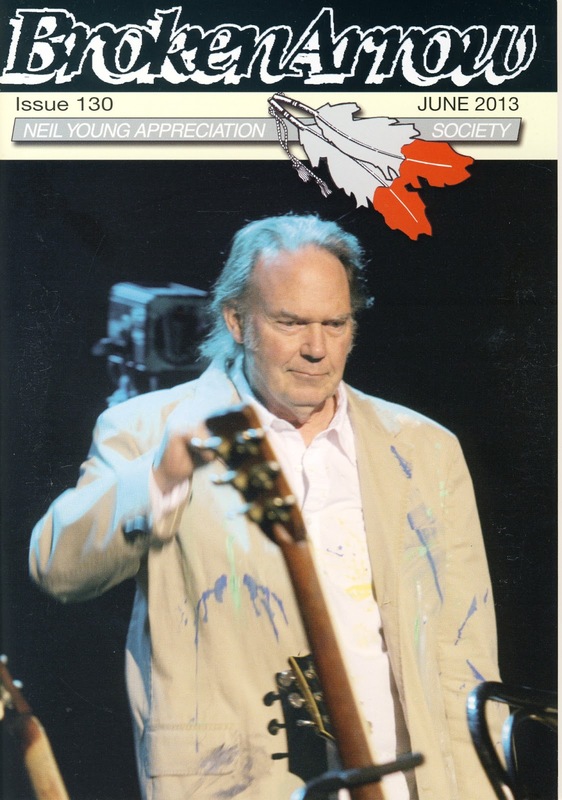 I am very conscious there are some NYAS members who do not have a computer and rely on the paper magazine for their Neil Young information. I believe most local libraries offer free internet access and a small charge for printing. Your challenge in the next nine months will be to make sure you learn how to use these facilities so that you can access and print the file off. Once you’ve worked out the routine it shouldn’t be difficult. We hope to run trials in September and December. In a way, I am sorry we have had to make this decision but we think it is the best option available. However, one big bonus with a file is that the magazine will be in full colour, and should look really good when printed! (Well, if you have it printed in colour…) Up until December 31st we will continue to accept new members but their subscription will also be pro-rated on the number of magazines that they will receive up to March 2014. One final point. There may be someone out there who would rather take the NYAS and Broken Arrow forward in a new and creative way. Jo and I would step aside in the coming months if someone comes forward with an attractive proposal. Please don’t hesitate to get in touch if you would like to discuss this and we welcome your thoughts on this whole subject. Remember – it’s your society and your magazine. When we initially read this, we were concerned about the log term future of both Broken Arrow & NYAS. Keeping these orgs strong and ongoing should be everyone's goal. We've been a supporter of NYAS going into our 4th decade now and hope it continues its long run. NYAS and Scott would like to hear from readers on your thoughts on future publication. Drop a comment below. As member 3055 NYAS is a superb quarterly read - thanks to the likes of Scott & Jo who have kept it going. A sign of the times I'm afraid and we can only hope it manages to survive, but this is an indicator of the change to electronic media which is instant. Also perhaps a decline in interest in NY as membership has decreased in the last few years? Or certainly been static. I actually find myself much more wanting to subscribe now that it's cheaper. Can't think I am alone. I prefer paper magazine. It's more comfortable to read than read the screen. I think that I could pay subscription up to 50 euros. It's 12,50 euros/BA.. Quite a lot, but I would pay it.. BA is so great magazine! I understand going to digital. It's ok and I accept it. The main thing is that BA keeps rockin in the free world. Big, big thanks and my standing ovations to Scott and Jo! You're done absolutely great job with BA! How about Thrashers Wheat and NYAS merge. TW would still have its free area of NY Fresh Wheat however offer a VIP Members area that would give access to NYAS and maybe even the archives if digitized. This would make sense to me since TW is already digital, has the traffic and serious followers who would pay for more content. How about that Thrasher? I think it would make sense to see TW and NYAS merge. TW is already digital, has the traffic, engaged audience etc. The Fresh Wheat news section could still be made available for the casual fan however a subscription service that includes NYAS and maybe its archives would be great. If the annual subscription rate was reasonable I don't think you would have trouble raising the funds to cover the expenses that normally TW relies on donations for. Perhaps a initial lifetime membership or VIP members area for extended content. This would mean a redesign in the current website that would be more SEO friendly, subtle advertising features to help offset costs, modern site etc. Agree with Soldier Steve! 9$ more a year, that's 75 cents a month, that won't kill us. We all prefer physical copy, especially this fanzine, which is exceptional and long-lasting! If video killed the radio star, internet will kill this magazine! Shocking News!By the way, I preferred the printed papers, but if it easier for Scott and his family and better for NYAS, it's good for me too. Part of my knowledge on Neil related things was initially based essentially on BA (and the work and the passion of many people), so I hope that this longtime effort (30 years!) can keep on. I concur with Soldier Steve. I think "Broken Arrow" is an excellent magazine and would be willing to pay $50 per year to have it delivered to my door. I have always been a fan of the hard-copy format. It's something real you can hold in your hands and flip through at your leisure. It's also easy to check back on info in old issues. Nevertheless, the new format and considerably cheaper dues may serve to attract some new members. However, I fear it may also mean that some current members who don't have computers may let their memberships lapse. Scott suggests that these members take advantage of free computer and Internet usage at their local public library. While this is good advice, it's harder to put into practice. I support Scott and Jo in their decision and will continue to be a member of the NYAS come what may, but I must admit that I will truly miss receiving BA delivered to my door. Thanks folks for all the thoughts and comments. This is helpful in helping us all figure out a path forward in these challenging times. Anyway. If I rattle on too much, folk will suspect that I am indeed a Pom....and that would never do.. Finally (WHO sighed.?) In that last Issue I have of Broken Arrow, Alan mentioned that it had cost him over 1000 Pounds to get that last issue out.... !! of his own money. I wonder, did he get that back? and I also wonder where he IS. I would love to have a yarn with him...Thanks for the time Lads n Lasses... hello,? hello.? HELLO. Hurumph, now where did THEY go.!! I prefer the sheer physicality of books and mags, and BA is a quality read. will still support it and be part of the NYAS. Any blame should lie with Royal mail and it's outrageous charges. I Live In The US And Pay $41 For 4 Issues.Thats $10.25 Per Issue.Every Issue OF Broken Arrow Is Worth That. For Me To Pay A LittLe More Per Issue And Still Delivered To My Door Is What I Hope for.Theirs Nothing Like Sitting Down The Day It Comes In The Mail Or Days After With A Cold Beer And ReadIng The Great Book It Is,Awesome Pictures,Concert Memories,etc.If It Goes Online Only It Will Fade Away. Keep The Issues The Way Its Always Been. Its Better To Book Than To Fade Away. I believe -- from what I last heard -- that there are currently 800 to 850 NYAS members. I believe there were more than 2,000 members at its height many years ago. I joined in August 1984 (NYAS member #1063) when then editor Alan Jenkins published his first issue (BA #16). I've been an avid member ever since. I believe "Broken Arrow" ranks as the longest running rock fanzine. There was a brief interruption in publication when Alan Jenkins retired but Scott and Jo Sandie picked up the slack a short time later. Surprising news! As I have recently purchased enough NYAS book folders to handle another 6 years of the best fanzine in the world, this just can't happen! NYAS must go on. One other idea to consider. Many TV shows that are now broadcast have the broadcast edit, with the additional extended interviews and special features online. (The Daily Show, The Cobert Report, for example, and even HBO shows like Game of Thrones). I understand being resistant to compromising one's art (and the mag does fit into that category, in my opinion) by making it less pages. But with a hybrid of a printed and web fanzine, perhaps we truly can have the best of both worlds. Merging NYAS with Thrasher's Wheat, and still printing a mag quarterly that is small enough to send out and have published could be the answer. If there is no printed magazine at all, it really seems that NYAS is over. I think it would get lost in the digital mess of content - and I am not including Thrasher's Wheat in the Mess. I think that raising the price to $50. is fine, too. Even $60.! Death to NYAS is not fine. Wanting to subscribe, and actually subscribing are worlds apart. Hell, for what we now pay for shows, and the price of the items of fluff we bring home, the Broken Arrow is a bargain with all the love and care and community it comes with. That special thing that comes in the mail. It FEELS SO GOOD! It would be a sad communication to turn it totally into bits. LOve it when Broken Arrow members can rattle opff their Membership numbers..... Seems I came to the party a bit late at 3979.!! thanks to Thrasher for adding my comment earlier on. Funny, today I am able to comment directly rather than just through Facebook. Reading all of the other comments, it would seem that the most popular opinion is to try to continue the hard Copy through the post. As we would expect though, there is an opinion that whatever is easiest for the originators should be taken into account. In the end, I too take that course. I will resume my Subs this week and will go with the flow as far as how we get our Copies. Funny, I was just looking at one of my Subs Renewal forms and it is 15 Pounds to renew, (To New Zealand) (US$25.00) A mere pittance for what we were getting. I dont know about now but the quality and the 'Stayin Power' of My mags from the 90's is great, they are still like new... Lets try to find a way to keep this like it always has been if we can... The trouble will be that a whole lot of effort could be put into keeping things the same, with Posted mags at a higher price.. but we cannot gaurantee that everybody that subscribes will go along with higher prices.... "Soldier Steve, (4576) suggested finding a way to vote and that would have to be through the magazine to ensure everybody was captured... Good idea but wait until I have my Subs set up.!! Good to see the comments and the interest. Long may you (all) Run. I would pay $50 for subscription for hard copy without hesitation! This publication is worth every penny and then some! I would pay $75 a year! Regarding the current subscription fees to "Broken Arrow"... There are four issues per year so that works out to just over $10 per issue, which is the regular price (or even less) of most mass produced magazines these days. Even if the subscription fee is raised to $50 per year, it would still be worth it to get a hard copy issue for that price. Well worth it, in fact. I am a long, long time subscriber to Broken Arrow and the NYAS (since the 90’s anyway) and although it will be sad to see a paper magazine no longer distributed, I think Scott has made the smart decision and I’ll be supporting him w/ a subscription and a small donation. No doubt in my mind: I want to see the delivered hardcopy survive. I would pay more for the pleasure of the anticipation, perusal, study, feel and comfort of the tightly bound BA. This is much better than my future DIY attempts to print and bind, which would eventually peter out - this would be a downward spiral for many into the darkness. I want to support Scott & Co, my attempt here is praise and encouragement for the unique pleasure BA provides in the current format. Perhaps if enough of us who have never subscribed get subscriptions, we can convince them that raising the price to $50.00 and keeping it on paper is worth it. Perhaps I'll get a subscription anyway, just so I can be pissed when it goes digital. And privatizing the post office is the worst idea anyone ever came up with. Okay, not quite as bad as for-profit medical care, which hopefully the UK never has to deal with. These despicable, greedy politicians, drunk on capitalist lies, need to go.